Promise to Restore the Temple. Roman emperor; born Nov. 17, 331; reigned from Nov., 361, till June, 363. 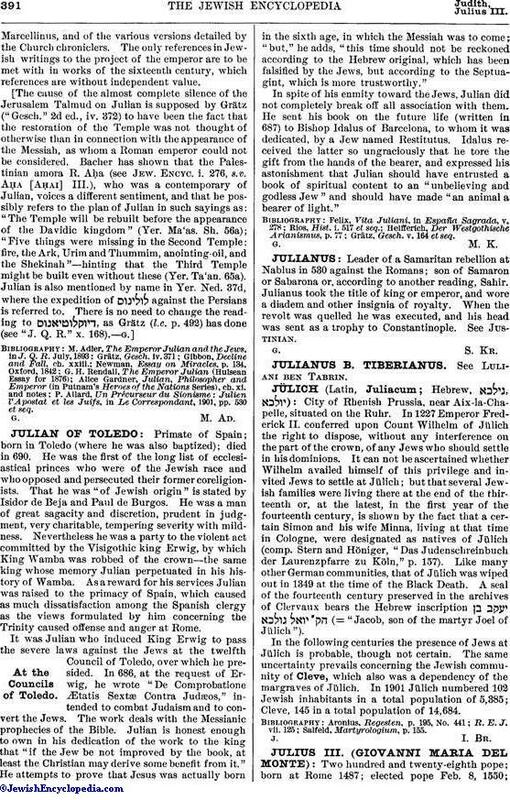 The recognition of Christianity as the religion of the state by Constantine the Great, uncle of Julian, about the year 312 had resulted in an increase of persecution for the Jews of the Roman empire; but Julian, immediately upon his accession to the throne, issued a proclamation extending freedom and equal rights to all sects and beliefs, Jewish, pagan, and Christian. In his passionate devotion to paganism, which he vainly sought to reestablish, Julian vehemently opposed Christianity; but for Judaism and the Jew he showed every consideration. His knowledge of Jewish affairs was extensive. In his writings he refers to the Sabbath, the Passover, the dietary laws, the laws of sacrifice, circumcision, and other Jewish practises. He is said to have established among the Jews of Palestine an order of patricians, who exercised judicial functions, and whom he entitled "primates" (called in the Talmud "aristoi"). His views upon Judaism are set forth at length in his polemic against Christianity. He regards Judaism as inferior to Hellenism, but vastly superior to Christianity. He is particularly severe upon the Jewish doctrines of monotheism and the election of Israel. He inveighs against the narratives of the Creation, the garden of Eden, the Flood, etc., with the same arguments as were employed at a much later date by Voltaire. Throughout his polemic (only extant in St. Cyril's works) he displays an accurate knowledge of the Old Testament, often quoting it with fluency. His acquaintance with the text was, however, limited entirely to the version of the Septuagint: he knew little or no Hebrew. The most important incident in his career that is associated with Jewish history is his proposal to rebuild the Temple in Jerusalem. This novel suggestion was propounded by him in a letter addressed to the "Community of the Jews," at the beginning of the year 363. 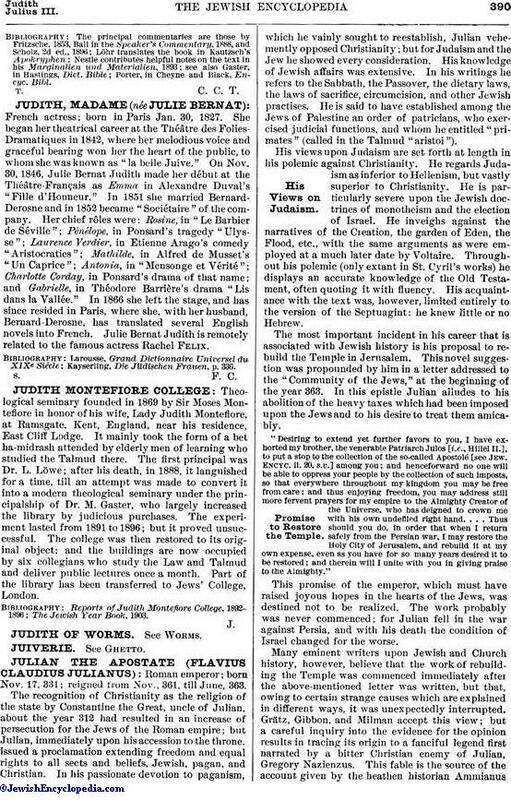 In this epistle Julian alludes to his abolition of the heavy taxes which had been imposed upon the Jews and to his desire to treat them amicably. "Desiring to extend yet further favors to you, I have exhorted my brother, the venerable Patriarch Julos [i.e., Hillel II. ], to put a stop to the collection of the so-called Apostolé [see Jew. Encyc. ii. 20, s.v.] among you; and henceforward no one will be able to oppress your people by the collection of such imposts, so that everywhere throughout my kingdom you may be free from care: and thus enjoying freedom, you may address still more fervent prayers for my empire to the Almighty Creator of the Universe, who has deigned to crown me with his own undefiled right hand. . . . Thus should you do, in order that when I return safely from the Persian war, I may restore the Holy City of Jerusalem, and rebuild it at my own expense, even as you have for so many years desired it to be restored; and therein will I unite with you in giving praise to the Almighty." This promise of the emperor, which must have raised joyous hopes in the hearts of the Jews, was destined not to be realized. The work probably was never commenced; for Julian fell in the war against Persia, and with his death the condition of Israel changed for the worse. Many eminent writers upon Jewish and Church history, however, believe that the work of rebuilding the Temple was commenced immediately after the above-mentioned letter was written, but that, owing to certain strange causes which are explained in different ways, it was unexpectedly interrupted. Grätz, Gibbon, and Milman accept this view; but a careful inquiry into the evidence for the opinion results in tracing its origin to a fanciful legend first narrated by a bitter Christian enemy of Julian, Gregory Nazienzus. This fable is the source of the account given by the heathen historian AmmianusMarcellinus, and of the various versions detailed by the Church chroniclers. The only references in Jewish writings to the project of the emperor are to be met with in works of the sixteenth century, which references are without independent value. The cause of the almost complete silence of the Jerusalem Talmud on Julian is supposed by Grätz ("Gesch." 2d ed., iv. 372) to have been the fact that the restoration of the Temple was not thought of otherwise than in connection with the appearance of the Messiah, as whom a Roman emperor could not be considered. Bacher has shown that the Palestinian amora, R. Aḥa (see Jew. Encyc. i 276, s.v. Aḥa [Aḥai] III. ), who was a contemporary of Julian, voices a different sentiment, and that he possibly refers to the plan of Julian in such sayings as: "The Temple will be rebuilt before the appearance of the Davidic kingdom" (Yer. Ma'as. Sh. 56a); "Five things were missing in the Second Temple: fire, the Ark, Urim and Thummim, anointing-oil, and the Shekinah"—hinting that the Third Temple might be built even without these (Yer. Ta'an. 65a). Julian is also mentioned by name in Yer. Ned. 37d, where the expedition of against the Persians is referred to. There is no need to change the reading to , as Grätz (l.c. p. 492) has done (see "J. Q. R." x. 168). P. Allard, Un Précurseur du Sionisme: Julien l'Apostat et les Juifs, in Le Correspondant, 1901, pp. 530 et seq.